The Piccadilly Line’s extension to Cockfosters opened in September 1932. The only station not to have any substantial surface buildings was Manor House, the next up from Finsbury Park which too had barely any surface buildings acknowledging its presence except this dedicated entrance on Seven Sisters Road. Finsbury Park tube station’s Seven Sisters Road entrance – which dates from the 1900’s. In order to build the line to Manor House the short run-over tunnels at Finsbury Park had to be realigned. This required additional work and meant the very first part of the tunnels towards Manor House were done with manual labour. Shafts were sunk in Finsbury Park by the tennis courts and from that point onwards tunnel digging machines could be used for the remainder of the line to Bounds Green where the line emerges into the open. The northbound platform at Finsbury Park. Until 1932 this was the terminus for all trains. The Piccadilly passes under much of Finsbury Park itself en route to Manor House. At Manor House it turns northwards and the line forms quite a long loop as it shifts direction from eastwards to almost due north. The line makes its first of two passes under the New River north of Woodberry Down. Manor House was an important road junction where interchange with North London’s main bus and tram networks were made. Unusually, because of the constraints of the layout and land being at a premium due to it having Finsbury Park on one side, it was decided to have the station built entirely beneath the road junction. There was sufficient land on the north west side for one small station entrance building which also served as a bus shelter. The one minor surface building at Manor House on Green Lanes. One Holdenesque touch, which is not so apparent, is the minor station entrance building depicted above. Its clearly a basic version of his brick box with a concrete lid concept. Manor House, despite not having surface buildings such as ticket halls and car parks etc, at least set the trend for the next two stations (Turnpike Lane and Wood Green) in terms of station decor. The platform air vent grilles at each of these three stations show local scenes and those at Manor House depict Finsbury Park itself. Manor House’s entrances/exits on Green Lanes. Manor House has seven exists which is a lot for a station quite well out of the central area. The reason for this was the need to have seamless integration between tube and onwards travel by either bus or tram (as on the rest of the extension.) A major tram interchange point existed here in similar fashion to Turnpike Lane, and stairs led directly to the ticket hall. That has all gone. The approximate site of the tramway central island platforms in Seven Sisters Road. Compare the above view on Seven Sisters Road with the 1933 picture below. The station’s platforms are wide and airy, this is because the platform tunnels at each of the stations were built to much larger diameters, although I suspect those at Manor House are somewhat larger still. 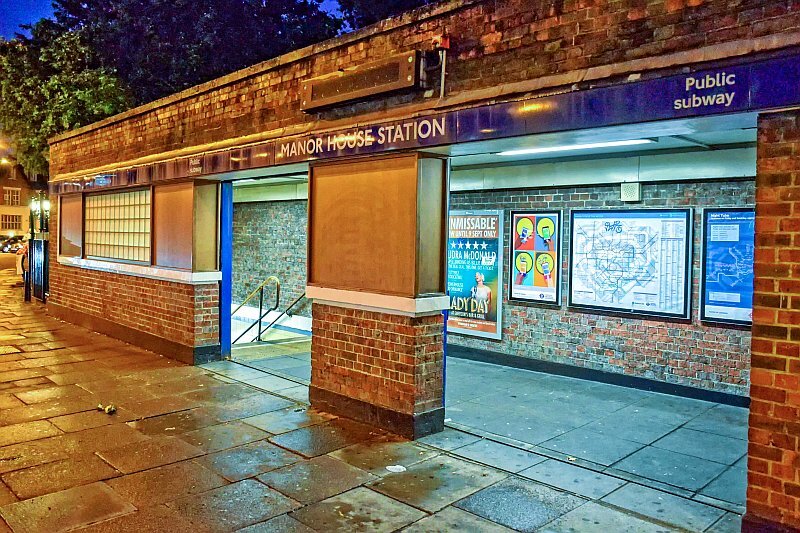 The spacious atmosphere and decor at Manor House is so much nicer and far more clean compared to the other stations such as Turnpike Lane and Wood Green. The spacious station platforms. 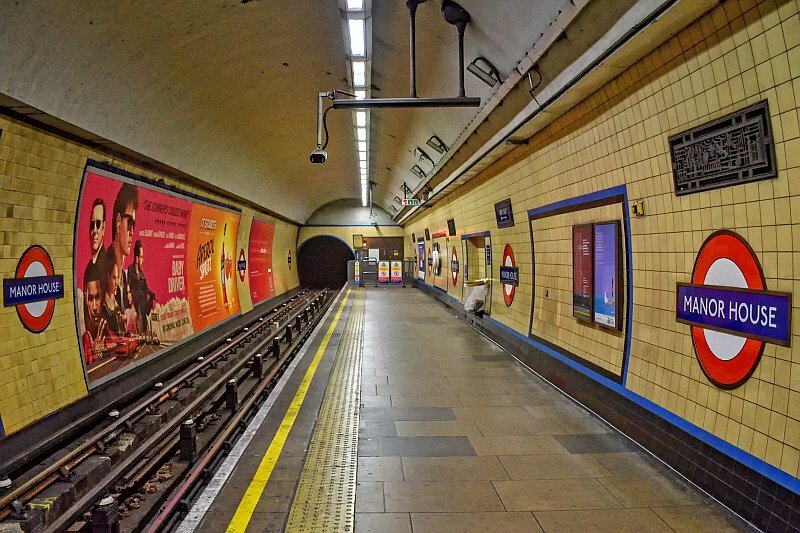 The anti-suicide trap (or track pit) was one of the first on the tube system. Manor House sign with Finsbury Park depicted on the grille above it. View up the escalators towards the Holden designed ceiling at Manor House. Charles Holden designed the station ticket hall with an unusual style of ceiling. This unusual work exists because there were no proper surface buildings where his architectural creativity could be used. Despite being partially hidden for years, this splendid ceiling has been restored. The ceiling extends throughout the ticket hall area and part of the access subways. 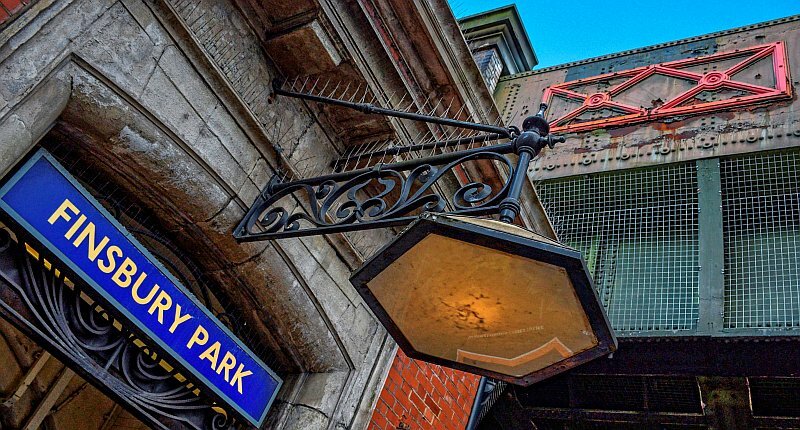 The blue colours at Manor House helps passengers to identify their own station. Each of the underground stations on the Cockfosters extension had a different colour scheme, for example Turnpike Lane is yellow. I think this was the last such major work to involve different colour schemes for each of the stations. Manor House’s middle pair of seating alcoves are unusually placed between the passageways. Other touches to Manor House station make it totally different in style to the other stations. In fact each station has some styling difference to each other that makes them unique rather than standard copies of each other, although to the uninitiated they will probably look alike. At Manor House one of these quirks is how the platform seating is arranged – with the middle seating alcoves sited between the exit passageways. The section from Manor House to Turnpike Lane is a considerably long one. It was debated whether an intermediate station at St Ann’s Road to serve Harringay should be built. A station at this point had been proposed as early as 1901 when the Great Northern and Strand railway (the precursor to the Brompton and Piccadilly Railway) proposed stations at both Harringay and Hornsey on its route to Wood Green. The road through Harringay by St Ann’s Road. The Salisbury Hotel is on the right. SUNDAY TIMES: NEW LONDON STATIONS 26 October 1930 p 23. Manor House, Turnpike Lane, Wood Green, Bounds Green, Arnos Grove, Southgate and Enfield West. The vent station at Colina Road, to the north of St Ann’s Road. A brick box with a concrete lid! Obviously Harringay was not on that list of stations to be opened on the extension. Anyhow, a ‘station’ of sorts was put here – a ventilation shaft building on the corner of Green Lanes and Colina Road. There is a special reason for the ventilation station being sited here as I will describe in another post. It’s been often claimed the Harringay option was dropped due to the area being well served by buses and trams. 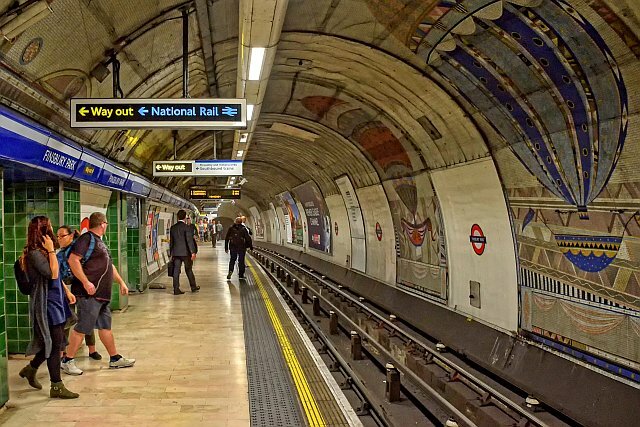 The real reason, according to Mike Horne’s book The Piccadilly Line (2007), was to save travel time, and that is one reason why York Road, on the Piccadilly Line further south, was closed on 19 September 1932 – the very same day the new line to Arnos Grove opened!